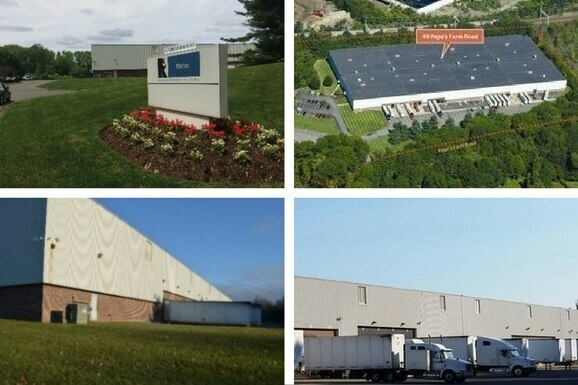 Property: Acquired at 50% leased, 40 Pepe’s Farm Road in Milford, CT is a single building, 200,000 SF distribution asset located in the densely populated I-95 market. Strategy: Low basis acquisition of an institutional quality high bay distribution warehouse with significant upside value through lease up. 40 Pepe’s Farm Road is an institutional quality distribution asset within one mile of I-95 and two exits north of Bridgeport, CT. The building is one of the only modern single story distribution buildings with 28’ clear ceilings in the I-95 corridor. The low basis and attractive physical specifications allowed Calare to aggressively market the space to the best tenants in the market with very competitive economics. Calare acquired the building at 50% leased in 2014 and sold it 100% leased in 2017. The sale produced a 32% net IRR to investors over a 2.5 year hold.